As I may have mentioned once or twice before, my husband loves butter. I do not, but am quite fond of my husband and readily admit that there is a limit to the items you can bake (well) with rolled oats and apple sauce. 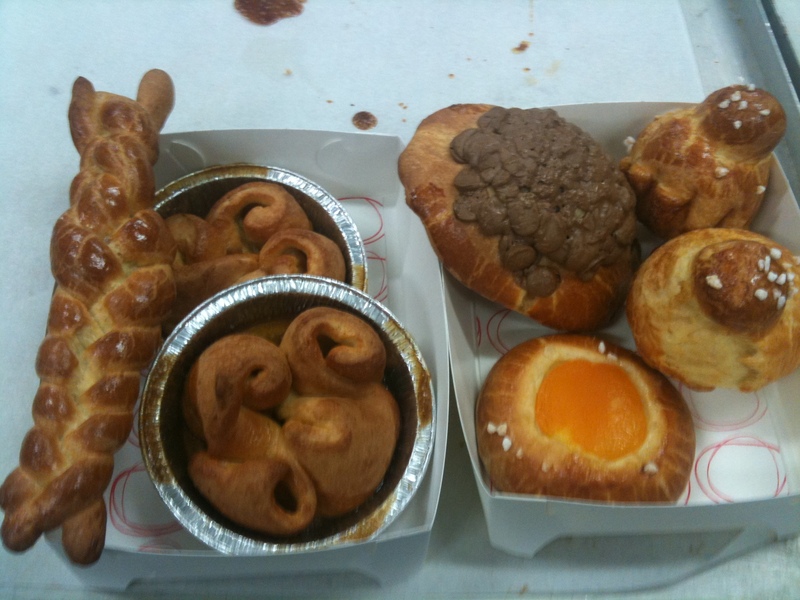 So I enrolled in a “Baking with Brioche” course at Brasserie Bread in Botany partly because I love to bake and partly to learn recipes that I could use to (hopefully) make other people happy. Luckily, Brasserie Bread is packed with sensational breads that make ME very happy, like their quinoa and soya loaf and their delicious caramelised garlic bread. Oh, and their sour cherry loaf! Oh, how I love bread. Anyway, back to the brioche. According to Wikipedia, brioche is a highly enriched French bread, whose high butter and egg content give it a tender, rich crumb. 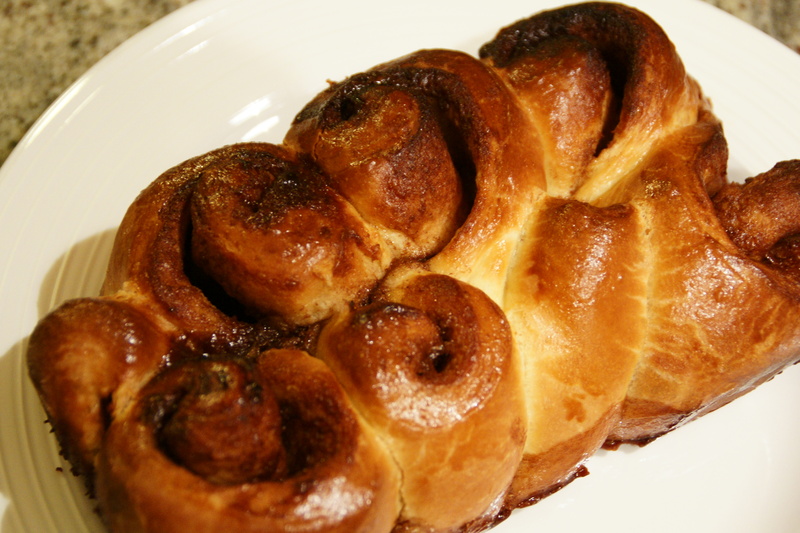 Brioche à tête is perhaps the most classically recognized form. Brioche à tête rise in fluted tins, with a large ball of dough placed on the bottom, topped with a ball of dough 1/3 that weight to form the head (tête). 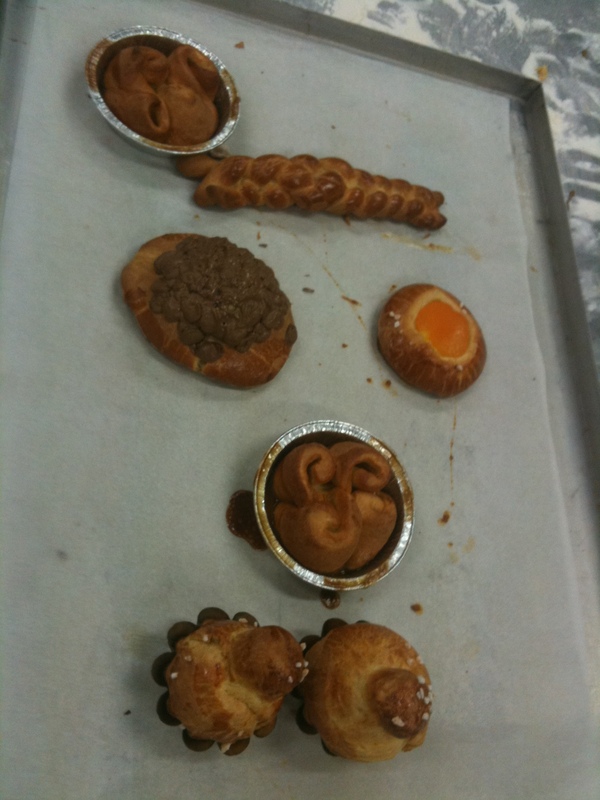 We started with some pre-made dough, which we made into sticky cinnamon buns, an apricot pastry, a chocolate pastry and a coulibiac, which is a pastry parcel containing fresh salmon, hard-boiled eggs and mushrooms. Starting with the dough that someone else (who is talented) had made was a very kind introduction, as the dough was soft, smooth and easy to work with. I was quite hungry by this time, so am struggling to remember the correct names and techniques for each item, but I know that each item began with a small amount of dough rolled under a cupped hand to form a smooth ball. The brioche à tête (or equivalent) was formed by using the edge of your hand to separate a small ‘bobble’ shape, which was then stretched out slightly. We then made an indentation in the larger ball with the tip of one finger, then gently poked the stretched bobble into the hole. How’s that for a clunky description?! The coulibiac was made by placing a piece of fresh salmon on a crepe, then spreading a seriously tasty russian mustard (which I must go back and buy from Brasserie Bread) on top, then topping that with an onion and mushroom sautee and pieces of hard boiled egg. The crepe was then wrapped around the salmon, and the brioche dough was then wrapped around the crepe parcel. The idea was to make the brioche parcel look like a fish, complete with scales and eyes, but mine more closely resembled a slightly battered pastry parcel. The coulibiac took about 18 minutes to cook and was DELICIOUS. I noticed that I was the only female participant to scoff the whole thing, but in my defence I had run 15kms of speedwork that morning. And did I mention that it was DELICIOUS? However, as delicious as the salmon was, the sweet items were possibly better. We made an apricot pastry by simply placing a drained canned apricot half on top of a round of brioche and I made a chocolate pastry by making a gondola shape and filling it with chocolate chips. I perhaps went slightly overboard with the chocolate chips, as the ‘gondola’ quickly collapsed under their weight. The apricot and chocolate were apparently good, but the star of the show was the sticky cinnamon buns. 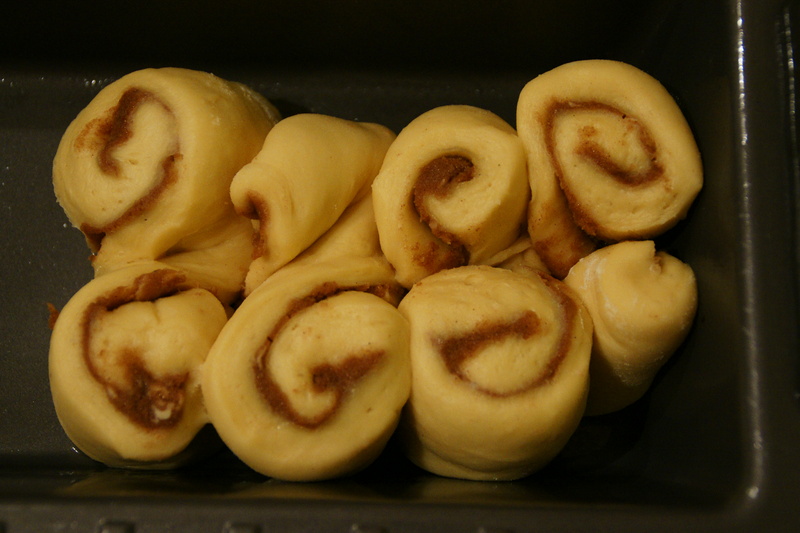 These were made by liberally pasting a rectangle of dough with a mix of butter, brown sugar, honey, cinnamon and vanilla. The rectangle was then rolled from each side into the middle, then rolled gently together to form a log. The log shape was then cut into four pieces. Each piece was then twisted to form a bow shape. Two bow shapes were pressed together to form a rough circle, and the circle was then placed in a foil pie tin for baking. The result, after baking and proving, was a gooey, sticky, spicy, light bun that tasted like the best donut/cinnamon cake/sinful indulgence you have ever had. 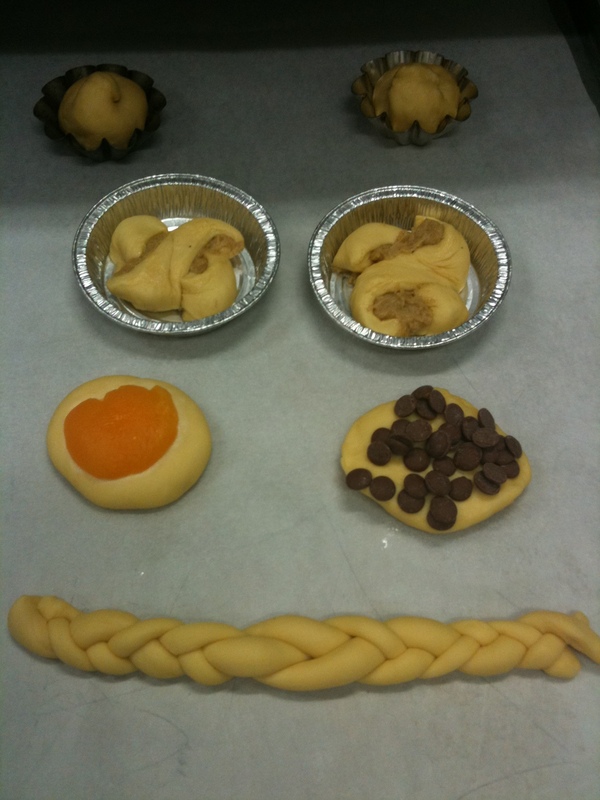 In other words, it wasn’t bad…We also made a braid, consisting of three strands of dough. My braiding needs some work, as you may notice from the photos below. Finally, we made our own brioche dough to take home and use the next day. Making the brioche dough basically involved making a fairly plain bread dough then squashing large amounts of butter into it, then slapping it around until the butter was incorporated and a smooth, elastic dough was formed. 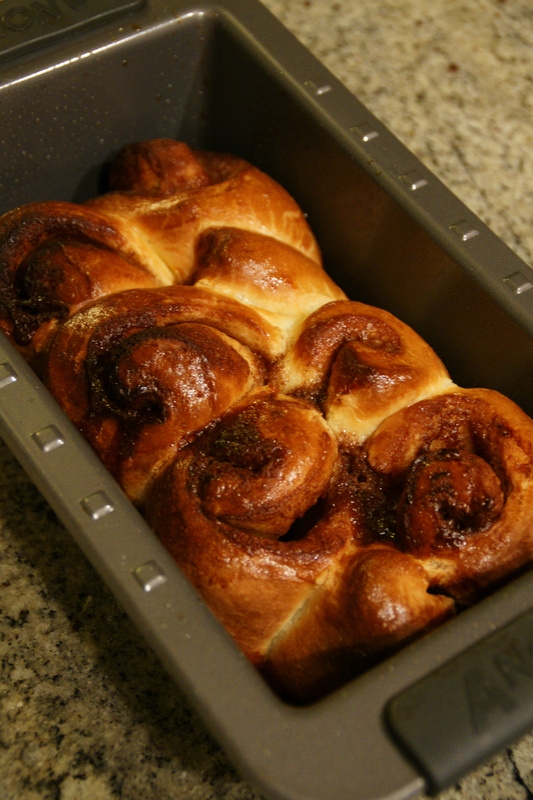 The next day, I used the dough we had made in class to try to recreate the sticky bun, albeit on a larger scale. As you will see below, it kind of worked. My pieces were not the same size, so that some ended up being taller than the others. Others were just plain untidy. I also got a bit distracted while the bun was in the oven and overcooked it a bit. It is a testament to the recipe that it turned out quite well despite these shortcomings.